Today’s world is more visual – in early days people has been using text to analyze data – but still there is no way to analyze data based on images – I think this is where our software come into picture and may perform some role in future – but there are few software in the world just give you image based analysis of data. When you are searching hotel on web only one way you find your favorite hotel is to type in Google search box or if you want to search your favorite book so you just type your favorite book in Google search box and hit search button then rest is your task to click on valid link and find best hotel or best book and start reading the details. If you imagine you start your search with images, let say you wanted to find Eiffel tower and you just type Eiffel tower in search box and hit the search button so instead of text link displaying below, there is new way you are finding Eiffel tower picture in spinning form, like all relevant links are coming in pictorial format – that’s all, we will give you such information where Google is working on it’. Google is going beyond because web is changing very fast, every day there is a new invention, Google is experimenting visual search instead of traditional text. 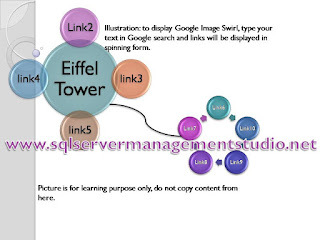 Google started a project in 2009 called Google image swirl basically gather various similar images as per your query with metadata –it’s a data about image and display them in hierarchy of image result. When Google was doing its test – so 4,00,0000 queries were supported in image search text box, now probably they have increased number of queries. In September 2010, Google research has added links to video in a given clusters with image similarities, if you are find your favorite hotel so all picture will be displayed some may be video links in the result set with Google image swirl. You also can try image swirl (try Googleling term image swirl) and tell us how you found information, visually or traditionally.